Seldom has a new product that isn't really new created such excitement as Amazon.com's Kindle 2, whose arrival was announced yesterday at New York's Morgan Library & Museum. The event has been anticipated for days and garnered intense coverage. 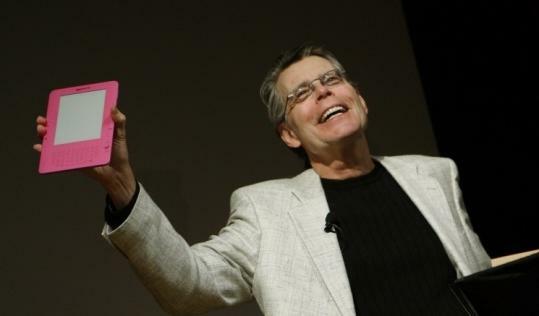 With novelist Stephen King on hand, Amazon CEO Jeff Bezos presented the improved electronic reader, which is pencil-thin, weighs about 10 ounces, holds as many as 1,500 books, and will sell for $359. The Kindle and similar devices inevitably raise a question about the future of printed books: Will the convenience of electronic reading make the experience of curling up with a book a thing of the past? Most authorities on the place of books in society doubt it. Yet Bezos yesterday made the new Kindle sound like the dawn of a new millennium. "Our vision is every book ever printed, in any language, all available in less than 60 seconds," he said at the unveiling. It isn't the device itself that is causing the stir, it seems - the Kindle 2 is an improved version of Kindle 1 - but the fact that people actually will be able to get one. It will be available Feb. 24 but can be preordered now. Sold only from Amazon.com, the Kindle was introduced in November 2007. When Oprah Winfrey showed hers on her talk show last fall and proclaimed it her "new favorite thing in the world," demand took off, the device sold out, and production was inadequate to meet the increased demand. A spokeswoman for Amazon did not return a call yesterday. To give the Kindle 2 a big kickoff, King has written a novella titled "UR" exclusively for the device; a Kindle even appears in the story. It's not clear whether the book, priced at $2.99, will later be available in print, and King could not be reached yesterday. The bigger question is whether the pent-up demand for the first generation Kindle will drive sales for the second. Even if it does, Amazon won't have a clear competitive field. Google's ongoing massive project to digitize millions of books in libraries - many of them still under copyright by living authors - had been contested on copyright grounds in a lawsuit by the Authors Guild and a group of publishers. However, the parties recently settled the dispute with a deal to split proceeds, and Google has announced plans to make many of the books available for download on devices such as Apple's iPhone. Cellphone books are already taking off in Japan, and Google hopes to meet a similar market in the United States. Whatever device is used, reading a book on an electronic screen is no longer considered bizarre, even for older readers. "I bought one and have been very happy with it," Mary Roberts of Roanoke, Va., said by phone yesterday. "I'm in a wheelchair, and with my arthritis I can't hold a book. When I visit my cousin in North Carolina, I don't have to take a suitcase full of books. It's very easy for me to read." Melinda Varian of Princeton, N.J., called the Kindle "a godsend. We are retired and travel all the time, and I can carry a couple of thousand books with us. It's fantastic." Varian has glaucoma and sets the text to large-print format. The Kindle and a similar device, the Sony Reader, are the most recent attempts to make the reading of books on a small electronic device practical. Earlier inventions, the Franklin eBookMan and the RCA eBook, were hard to read and offered few books. But the $299 Sony Reader and the Kindle use E-Ink technology, which makes the exhibited "page" look like a real book page. Leather covers, which make them seem more like books, are sold as accessories. Still, no one would ever confuse the Kindle with a book. Measuring 8 by 5 1/2 inches, it is as thin as a magazine. Because it is wireless, it doesn't require a computer to download books, most of which cost about $10. Its capacity is about 1,500 books, and the available library is 230,000 books. The Kindle also has a sound card and can convert text into speech, and it can access newspapers and other documents, including blogs. Few people think this is the end of the book as we know it, however. "The success of the Kindle is a significant event in the way people consume booklike texts," said Geoffrey Nunberg, linguist at the University of California at Berkeley's School of Information and an NPR commentator on language. "But whether it's a sign of the decline of the book is less likely." New technology, Nunberg said, seldom kills its predecessors. "Almost always, one technology refines another, as photography refined painting. There's nothing broken about the book as a form. It still works." The Kindle and Sony Reader have raised concerns among some authors, particularly about payment, said Paul Aiken, executive director of the Authors Guild. "The guild is fine with reaching new readers," Aiken said, "but the big issue is the royalty rate." A standard author rate is 15 percent of list price. "The royalty strikes us as low, since at $9.99, Amazon.com is selling at a low profit or a loss." Caveats notwithstanding, even some authors have been beguiled by the Kindle. Lois Lowry of Cambridge, an author of bestselling young adult fiction, bought a Kindle as soon as it came out in 2007. While she concedes there is a fairness issue with royalties, she wouldn't part with hers. "I love it," she said. "I travel a great deal, and my worst fear in flying is to finish a book over Iowa. I can load this thing up with a lot of books, and if I don't like one, I can switch to another. I tend to wax eloquent about the purity of the book, of holding it, etc., but in a very short time this has come to feel like a book."